In today’s world of fast growing technology it’s important to keep up with the latest opportunities. 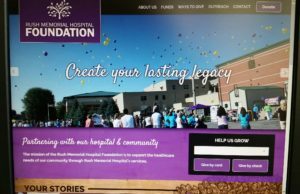 The Rush Memorial Hospital Foundation Board is pleased to announce the launching of their new website. The web address is: www.rushmemorialhospitalfoundation.com. The updated version showcases many pictures from activities and events of the RMH Foundation. Any information that the public would need about the Foundation is found on the website. The history, mission, leadership, events, and funds are found on the webpage. Many of the tabs within the website have photo galleries showcasing the activities and local people involved. There is a section on Employee Giving explaining the mission of the very involved Rush Memorial Hospital employee philanthropic organization called Cultivation Club. The RMH Foundation’s Seed Circle is highlighted under Outreach and explains the mission of this growing group of local women that learn about the services of Rush Memorial Hospital and the RMH Foundation. They support many projects of the RMH Foundation too. There is a section about the RMH volunteers and how to get involved at Rush Memorial. So take the opportunity to go online at www.rushmemorialhospitalfoundation.com and look at all the things happening at the Rush Memorial Hospital Foundation. And while you are there consider a gift to support outstanding healthcare provided right here at home at Rush Memorial Hospital.